The popular Islamic website IslamOnline has been, until very recently, an undisputed success story. Here was a website that neither shunned nor alienated. Its influence was upbeat and positive rather than destructive and divisive. While it wasn't an apologetic outlet, it reached out patiently and progressively to present Islam and Muslim issues to the world. These were understood and communicated by hundreds of scholars and journalists, who toiled day and night from their Cairo offices. Then something happened to abruptly bring the noble mission to an end. The success story suddenly became a nightmare for hundreds of IslamOnline's principled employees. The website (IslamOnline.net) remained online, but it was seldom updated. Instead, videos appeared on You Tube showing tired-looking IslamOnline staff chanting in the lobby of their building in Cairo. They were demanding the return of editorial freedom and rights. They were calling for justice. These bright journalists, some of the finest in the region, should have been sitting behind their computers writing, editing and managing live dialogues between inquisitive readers and learned scholars. Instead, they were seated on the floor with signs and banners, shouting. Something had gone horribly wrong. In a recent Associated Press report Hadeel El-Shalchi tried to explain: "The Qatari government has forced out the moderate leadership of a popular Islamic website and plans to reshape it into a more religiously conservative outlet, former employees of the site said." 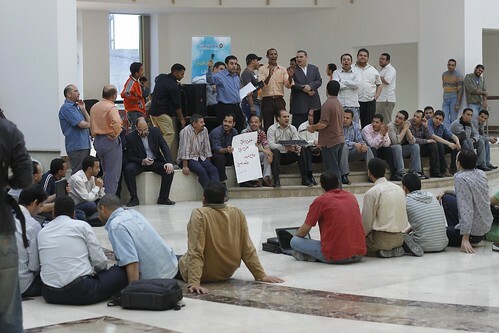 According to the AP report, "the site was thrown into turmoil... when the owners attempted to change its approach, prompting 350 of its workers in Cairo to go on strike". "Management in Doha then cut off their access to the site and have been updating it with news articles but not the diverse content IslamOnline is known for, said the former employees." IslamOnline is funded by Al-Balagh, a Doha-based company. Al-Balagh was headed by Sheikh Youssef El-Qaradawi, a respected and judicious religious authority. He is known, and much liked, for his progressive views on Islam. El-Qaradawi is also very popular among Muslims around the world, not least because of his daring political views, his strong anti-war, pro-resistance stances and moral clarity on many issues. In short, El-Qaradawi is the antithesis of religious clerics who do as they are told. A striking IslamOnline editor described to me how the crisis developed. It sounds similar to a coup. The sheikh was removed from Al-Balagh, the site's directors were demoted and a new management was imposed. The website's passwords were changed so that employees could no longer access it. Angered by such moves 350 employees went on strike only to find themselves the subject of legal investigation by company lawyers for exercising what is universally accepted as a fundamental right. The editor tells me that they were harshly criticised, in particular for their uncompromisingly courageous coverage of Palestine and Gaza. Indeed, IslamOnline had worked tirelessly to promote greater awareness of the struggle in Palestine, to Muslim and non-Muslim readers alike. Following the tragic events of 11 September few websites have played the vital role that IslamOnline has. Its editors did not serve the cause of fanatics, with their dreadful interpretation of the world and themselves. But nor were they content to serve as mouthpieces for Arab governments. Equally important, they did not try to falsify a moderate position to please governments, whether Arab or not. They reflected and expressed the views of mainstream Muslims from all walks of life, and from all over the world. It was truly an impressive feat to see such an independent editorial line emerging from one Arab capital, largely funded by another. It seemed too good to be true. The story of IslamOnline is now being presented as one between rival Arabs: governments, groups and individuals. Reductionist terminologies -- such as conservatives vs moderates -- are once again permeating the predictable Middle East discourse. Many questions still remain unanswered. Yet, the story of IslamOnline pertains more to media freedom and editorial independence in Arab countries than to inter-Arab rivalries. The struggle is between the self-serving politicking few, and hundreds of media professionals, the brilliant and inspiring young women and men who made up the staff at IslamOnline. For them, IslamOnline was not just another job. It was a mission, and millions of readers around the world appreciated their work, every word of it. One can only hope that IslamOnline will find its way back, with its staff and editorial line intact. The success story must not be allowed to end. * The writer is editor of PalestineChronicle.com.